Draft letter from C. Sauro to Mr. Zavitz, September 22, 1940. From his arrest, Clementina was relentless in her mission to have her husband released. She wrote many letters on his behalf, including in one example, a letter to M.J. Coldwell, a Social Democratic politician and a fellow clergyman. As a result, Coldwell raised the issue of Libero’s internment in the House of Commons, pointing out that Sauro’s sons were in the Canadian services. Under the DOCR (Defence of Canada Regulations), after 30 days, internees could formally object to their detention to an advisory committee appointed by the Minister of Justice. The Minister of Justice then appointed a judge to review the internee’s case. 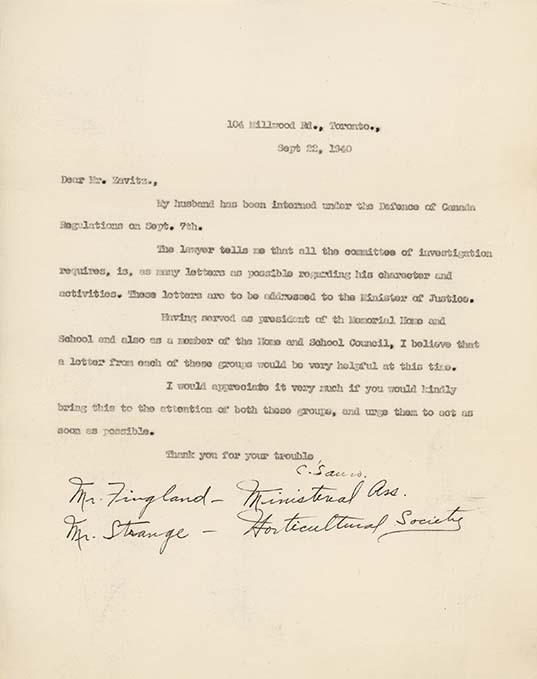 This meant an examination of the RCMP’s evidence against the internee, meetings with the internee, and interviews with witnesses who could attest to the internee’s character. After this, the judge either recommended an internee’s release or continued internment to the Minister of Justice.